The Agrigator is a new line of wireless irrigation monitoring systems introduced by Orbit Communications . 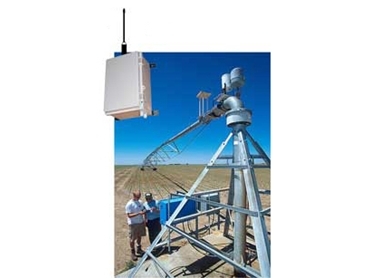 Incorporating several technological advancements, the Agrigator wireless irrigation monitors are designed to control pump operation by monitoring the state of pivot or lateral irrigators and sending this data by wireless link back to the pump. In the event of issues arising at the pivot such as pivot out of line, loss of pressure or circle complete, the Agrigator will switch the pump off and prevent the pump from being started again until the issue is sorted out. When an issue is detected by the Agrigator, an optional GSM/Next-G dialler will send an SMS text alert to a maximum of 5 mobile phones to alert the farmer or maintenance person of the situation. Agrigator wireless irrigation monitors are designed for reliable ongoing performance and will continuously monitor the wireless link between the pivot unit and the pump control unit so that the pump can be shut down immediately if there is any issue with the link. The wireless link uses 2-way communications between the pivot and pump to ensure all messages get through. The GSM/Next-G dialler features a high gain antenna to ensure healthy mobile phone signal reception. Agrigator wireless monitoring systems are housed in a robust waterproof, dustproof and UV stable enclosure making them suitable for operation in rugged outdoor conditions. The Agrigator operates from 12V or 24V DC, or optional solar power supply with no requirement for tuning or ongoing maintenance.